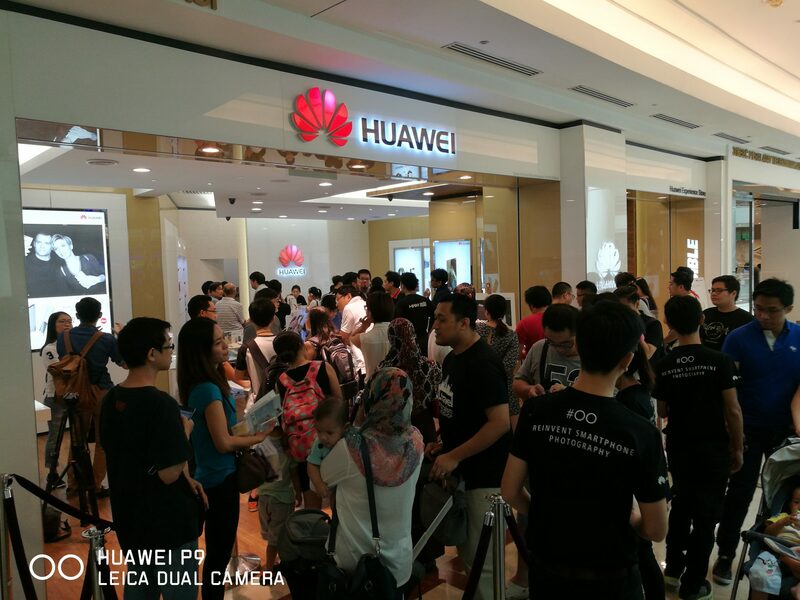 Kuala Lumpur, 30th May 2016 – Huawei Technologies Malaysia enjoyed a rousing response from Malaysians who turned up in droves to get their hands on the Huawei P9, which together with the Huawei P9 Lite, went on sale on Saturday, May 28, 2016. Despite the country’s economy slowing down, the Huawei P9 still recorded strong sales on the first day, showing signs of the nation’s confidence growing towards the company and its devices. The Huawei P9 series marks the latest flagship smartphone from the mobile giant that is set to strengthen its position as the new choice of consumers. The eagerly anticipated P9 owes much of its popularity to being the first smartphone born out of a collaboration between Huawei and global iconic camera brand, Leica, resulting in a stunning dual-lens camera in a smartphone. The P9 sets a new benchmark in smartphone camera technology, with more light and better clarity, to capture brilliant colour and striking black and white images in true Leica style. The P9 family fuses cool, sleek design and precision detail with state-of-the art technology to change the way we see the world. It continues Huawei’s legacy of producing premium mobile devices that have set the industry standard for elegance and performance. Huawei mobile devices are available in more than 180 countries and 16 regions worldwide through cooperation with over 1,300 channel partners; its Southern Pacific region continues to be one of its most important markets. To that end, Huawei has built its Asia contact hub in Malaysia to provide a seamless customer engagement experience but also as a major acknowledgement of its commitment to this region. Malaysia also enjoys the distinction of being the first country within the Southern Pacific region to see the P9 and the P9 Lite hit the stores. The growing recognition for Huawei smartphones was especially evident at Huawei Experience Stores nationwide. Malaysians began queueing up as early as 8:00 a.m. to be the first in line to experience the P9 when stores opened at 12:00 noon. In line with its debut, Huawei Malaysia sweetened the deal with additional goodies for its first 200 customers at selected stores across Kuala Lumpur, Penang and Johor Baharu. The success of Huawei’s P9 series, which includes the P9 Plus, has been phenomenal following its global launch in London in April this year which saw included the unveiling of Hollywood actors Henry Cavill and Scarlett Johansson as global product ambassadors, while world-renowned photographers, such as Mary McCartney and National Geographic World Press Photo Award winner, David Guttenfelder showcased their photo exhibits taken with the P9. Based on latest Q1 2016 global smartphone market reports, Strategy Analytics and International Data Corporation (IDC), Huawei was listed as the third top-selling device maker worldwide. These findings showcase the growth and momentum of Huawei’s consumer business, which shipped over 28.3 million mobile phone units globally in Q1 2016, a 64% year-on-year increase. Most notably, Huawei was the only device maker among the top three players to maintain rapid growth, beating the trend which saw total global smartphone shipments decreased 3% compared to Q1 2015. The P9 and P9 Lite could be yours at an attractive RM 2,099 and RM 1,099 respectively at a Huawei store near you.